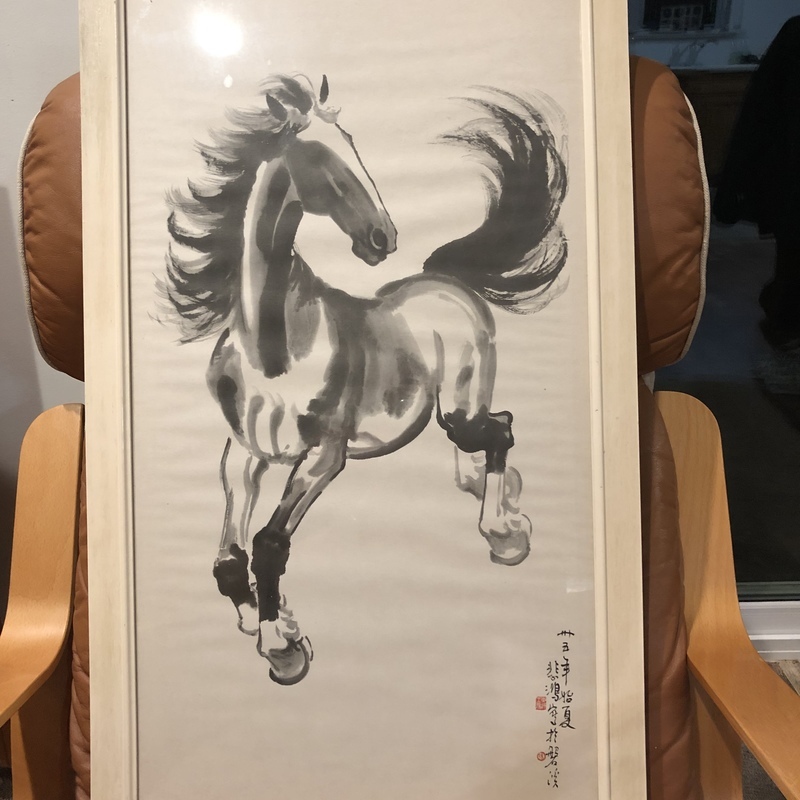 16x29 framed black ink stallion; smuggled out of post war Europe in early 1950's. the provenance is straight forward: my father purchased it from a little bookstore in Northern Netherlands after the war, packaged it up (hid it) and brought it to America in 1957 and it is still in our family. Thank you for submitting your item for appraisal. This appears to be one of the most popular prints by 徐悲鴻 depicting a young horse. It is an offset print as you can clearly see when you view the print with a magnifying glass or loupe. The round dots at the edges of the chinese characters. The estimate is based on identical prints currently on offer at auctions. There is no measurement for the sentimental value you might attach to the item. Based on the true history which you may have given little credibility (I came with it in 1957 and know where my dad bought it in 1949)!! What if it is one of his originals or personally signed prints?! Do you really think I would spend the time and money for you to tell me the obvious!!!!? When need to move beyond the simple!! Unfortunately is just a print. I would have gladly told you a more positive result. Yea. I agree! Oh well!! !